(Scott Sommerdorf | The Salt Lake Tribune) Utah Governor Gary Herbert, left, listens as House Speaker Greg Hughes, R-Draper, speaks about the successful expansion of the Medicare program in Utah, Wednesday, November 1, 2017. House Speaker Greg Hughes made no secret of one his main goals in his final lawmaking session. On Day One, he called on his colleagues to flex their legislative muscle and pass bills that would give them oversight of the executive branch. 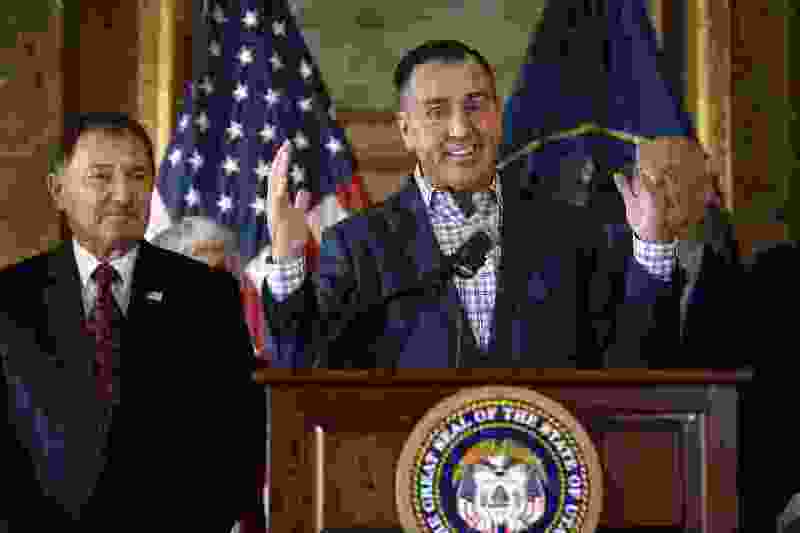 “This is a call to arms,” the Draper Republican said in his speech kicking off what was to be his swan song in the Statehouse. The challenge led Hughes and others in the GOP-dominated Legislature to assert that their power is on equal footing with the state agencies that carry out laws and the courts that interpret them. Rightly so, Hughes said shortly before the session finished. Others say lawmakers overreached. While several bills didn’t pass, the House lobbed bill after bill related to legislative authority, creating what became a theme for the session of attempted expansion of power. Gov. Gary Herbert is now looking over what made it to his desk with an eye toward vetoing several bills that his office and others who watched the 45-day legislative session say could tip the balance too far in favor of the Legislature. The Legislature attempted to create a committee that would give members power to oversee the budgeting process of cities, counties and schools and the rule-making authority of state agencies. HB175 led to a massive outcry from the local governments that would have fallen under the purview of the Joint Committee on Governmental Oversight, with fears that the panel would become a political weapon. The bill, backed by Hughes and other leaders, failed despite repeated attempts to push it over the finish line. (Trent Nelson | The Salt Lake Tribune) House Speaker Greg Hughes oversees voting in the House Chamber in Salt Lake City, Thursday March 8, 2018. Legislators did pass a bill to allow them to intervene in legal challenges to the laws they create, a position typically reserved for the attorney general’s office. SB171, which would give lawmakers the “unconditional right to intervene” in a legal challenge to state law, is on its way to Herbert. While craving the ability to defend in court the constitutionality of laws they enact, they don’t want their own attorneys giving public warnings that their legislation could, in fact, violate the Constitution. HJR14 does away with so-called legislative review notes that call into question the legality of bills. Lawmakers also say it’s time to change the Utah Constitution. Emergency isn’t defined, leaving the door open for lawmakers to decide that as the occasion arises. The bill stems from then-U.S. Rep. Jason Chaffetz’s departure from Congress last year, and lawmakers’ ensuing battle with the governor, who set up a special election to pick a replacement. Lawmakers wanted to have a say in that but were powerless to act when Herbert refused their request for a special session. (A separate bill stemming from a related conflict would require the attorney general to write opinions for legislators when asked). House Majority Leader Brad Wilson, R-Kaysville, said that last year’s midterm congressional vacancy would have been the type of situation in which lawmakers would exercise the authority to call themselves into session. “A congressional seat in Congress, 25 percent of our seats vacant for an extended period of time, would feel like an emergency to me,” he said. Voters will have the final say on the proposed constitutional amendment in the November election. That issue will join several voter initiatives that could appear on the ballot — although lawmakers succeeded in striking a deal to end the Our Schools Now push. If any of the remaining measures pass — such as legalization of medical marijuana — lawmakers want a crack at tinkering with them before they take effect. They proposed HB471, which would have delayed implementation of initiative laws approved by voters. Lawmakers in states that allow initiatives typically clean up such voter-written laws, coordinating them with existing law. But some were concerned the Legislature would undermine the will of voters. The Senate failed to take up the House-passed measure. (Rick Egan | The Salt Lake Tribune) Salt Lake City Mayor Jackie Biskupski makes a comment on SB234, the inland port bill in the Economic Development committee meeting, Friday, March 2, 2018. The Legislature also trod into territory cities consider their domain. House members wanted to prevent local governments from advocating for federal land designations — such as national monuments — before appearing before a legislative committee. Representatives approved HB136, but senators balked. Lawmakers created a new authority to oversee development of an international trade hub on a huge swath of land near the Salt Lake City International Airport. Lawmakers passed HB361 regulating billboards in a way that some cities fought as weakening local control. And they attempted, but failed, in SB218 to ban local governments from imposing fees on or banning plastic bags in retail stores — as Park City has done. Legislators also took aim at executive branch employees with HB391, which sought to prevent public workers from lobbying the Legislature. School employees felt it would have blocked them from speaking out on education issues. Herbert headed off the bill by issuing an executive order barring public employees from using state resources to lobby lawmakers, but they’re still free to speak on issues in their own time. 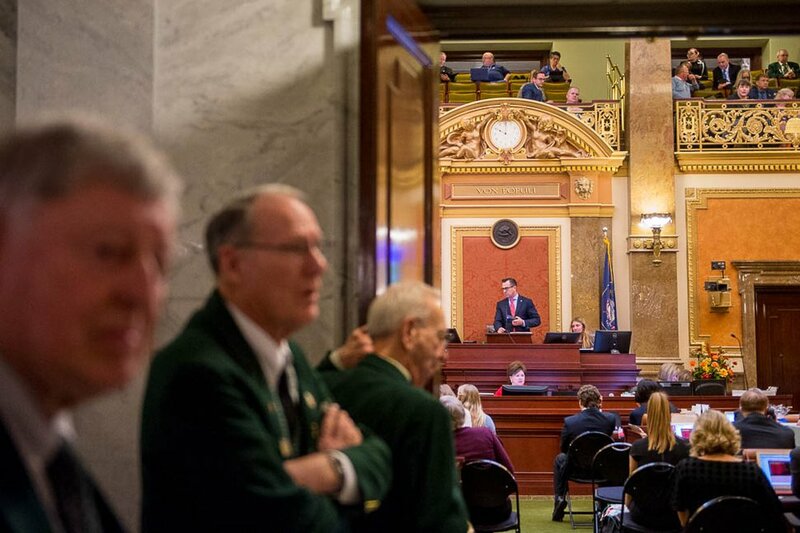 For Hughes, lawmakers were attempting to send a signal to Utahns that the Legislature’s power is as weighty and important as the other branches of government and that its influence doesn’t expire at midnight on the final day of its annual session.